Starting early on Monday morning, the roads alongside Wellesley will fill with students and community members forming one of the oldest and most beloved of Wellesley traditions: the Wellesley Scream Tunnel. The Scream Tunnel is as old as the Boston Marathon itself. In 1897, the first runners were cheered on by Wellesley students who had a particular favorite among the athletes. 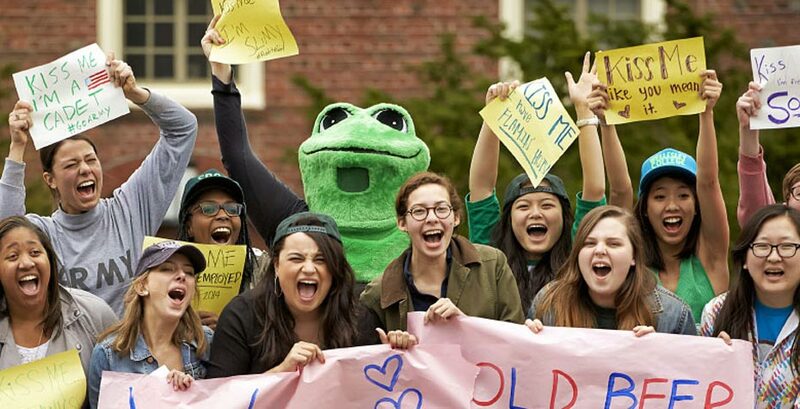 Ever since then, Wellesley students have congregated to scream, shout, and proffer kisses to lucky runners as they pass the grueling halfway point of the event. Competitors love the Scream Tunnel (one racer is reported to have doubled back and run it twice, he liked it so much). And media too, from Sports Illustrated (source of this photo) and ESPN to local CBS news affiliate WBZ and the Boston Globe, find it compelling. Students have often held signs for runners and in recent years the effort has become more organized and far-reaching. In 2014, we could even call it massive. In Munger Hall, this year led by House President Molly Tyler, students have made almost 800 personalized signs for runners based on requests submitted via a Google form from all across the globe. With no classes on Marathon Monday, Wellesley students and friends typically make a day of it. In addition to the Scream Tunnel, they gather for a barbeque, moonbounces, and an evening concert organized by the Schneider Board of Governors. This year’s Marathon Monday carries particular significance after the tragic events surrounding the 2013 Boston Marathon. Always welcome, alumnae have been especially encouraged this year to return to campus to add their voices and spirit. As Boston comes together once more to commemorate and celebrate a sense of solidarity, resilience, and community, Wellesley is determined to make the 2014 Scream Tunnel the largest and loudest of its 100-year-plus history. Senior Hailey Lee created a video capturing student preparations for the 2014 Marathon . Can you hear it? Soon you will.